This is what makes New York City so wonderful. 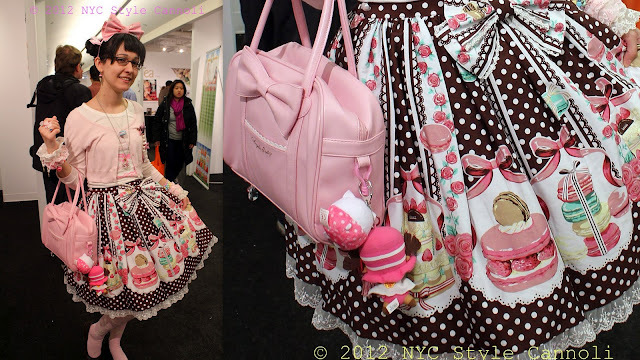 This girl was attending the 2012 Coffee and Tea Festival in February and well, I just loved her whole style! The skirt was amazing, macarons all over it with bows and lace trim. Her earrings were ice cream cones, macaron necklace and bracelet were her jewelry of choice. My assistant spotted her and asked if she would mind me taking her photo. She was nice to do so and before I knew it, some other media outlet wanted to see her too. Guess we have good taste. Would you be so daring to wear this outfit? She rocked it, big time!! I would never wear it, but that skirt is amazing! I wonder where she found it. She had such a flair about her. It was really adorable! I loved the skirt and I think she said it was made for her. We were so taken a back by the whole outfit and before I knew it, she was whisked away! It is so great to be fun and carefree!! It was actually her skirt! but would make a cute apron indeed! !